But, they think they don't receive enough, and now they're trying to pass a new "Private Copy Law" with which they hope to put a tax on every digital storage device! A few cents for every Gigabyte on every hard drive, memory card, embedded flash storage, etc. A tax that is so obscene that would invert the usual market tendencies where you get roughly the double amount of storage space for the same price every couple of year - and make presumable larger hard drives more and more expensive as they come to market. It's the Lei da Cópia Privada (PL118) and it would mean that even if used your hard drive just to store an operating system... you'd be paying for that "author's society" (and again, without really knowing which authors would get what). This is causing a bug outcry from the portuguese society, and SPA has tried to validate their point by presenting a list of one hundred authors and artists that support this PL118 law. There's no denying that some author might thing its a good idea... even though it might look suspicious that they could get only a hundred of them among their 25k+ registered members; and even though that roughly 20% of those 100 are the association board members; the really horrendous part is that we now found that some of those nomes were put there without any consent from the authors! 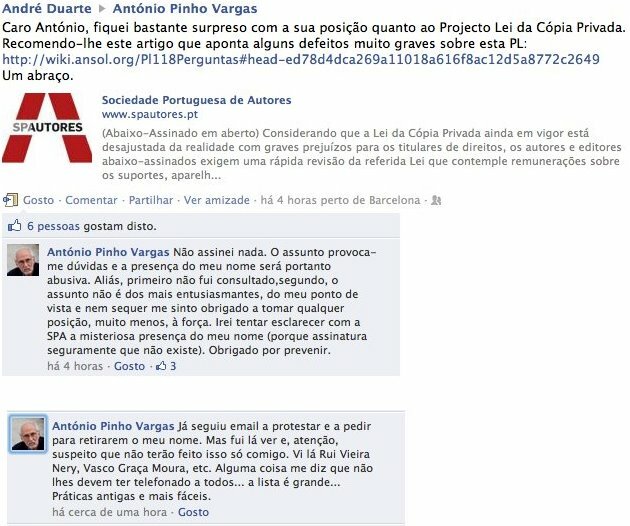 António Pinho Vargas (one of my most appreciated Portuguese music composers, you should check his Tom Waits if you don't know him) has came forth and revealed that it has no idea of how his name got there, and that he was never contacted about it. More so, he said he doubts some of the other names he sees there, from friends of his, would have agreed to that as well!